During a recent trip to China, I had the opportunity to attend the 2nd International Fuel Cell Vehicle Congress, held in Rugao, Jiangsu Province, on November 9th and 10th. Put simply, the conference was one of the most important industry conferences I have ever attended. (Keep in mind that the first industry event I attended was almost 20 years ago.) In fact, 2017 is a year that has been marked by high quality industry conferences and events, including events held in Tokyo, Davos, Vancouver, Sacramento, Copenhagen, Beijing, New York, Rugao and Bonn. This China trip was my 30th in the past 34 months, including my fifth visit to Rugao. Mr. Ma Jinhua, Vice Secretary of Party Committee of Rugao, is an important local politician in Rugao. Mr. Ma has also been an early adopter and a strong hydrogen and fuel cells champion in China. I have heard Mr. Ma humbly and proudly say more than once about Rugao, "We are a small city, but we have big ideas." This has been emphatically proven over the past few years with Rugao’s leadership in China’s emerging hydrogen and fuel cells industry. Indeed, last year Rugao was named as a UNDP Hydrogen Energy City. Mr. Ma also proved that Rugao not only has big ideas, but it also hosts big conferences. The FCVC conference was sold out, with over 1,000 attendees. The conference featured high value presentations and discussions with key industry leaders. There was significant industry transparency and collaboration. We discussed how to continue to progress the hydrogen and fuel cells industry in China and globally. Another hydrogen and fuel cells industry champion, Mr. Andrew Hinkly, Executive Head of Marketing at Anglo American Platinum, provided an outstanding keynote speech. Anglo American Platinum is a leading producer of platinum group metals and accounts for ~27% of the global refined platinum supply. Their metals are widely used in industrial applications including autocatalysts and fuel processing and the company continuously invests in growing demand for their metals. Anglo sees strong potential for the mass commercialization of fuel cells, which use platinum as catalysts and it has a portfolio of platinum development activities, including providing leveraged funding for university and research programs, direct equity investment in hydrogen and fuel cell companies, and indirect investment in advocacy programs. Anglo American Platinum is a founding member of the Hydrogen Council and was the largest sponsor of the Rugao congress. (Disclaimer: Anglo American Platinum has been a strategic investor in Ballard since 2014, holding ~4.8 million shares of Ballard, currently representing ~2.7% of Ballard’s outstanding equity.) Citing the Hydrogen Council, Hinkly noted that building the hydrogen economy is expected to require annual investment of US$20-25 billion until 2030, representing a cumulative investment of ~$280 billion that is expected to enable US$140 billion in annual revenues. I had the honor and privilege to serve as Chair for a key panel discussion on fuel cell vehicles. Three of the panel presentations were remarkable. First, in one of the most exciting presentations of the conference, Ki-Sang Lee, Senior Vice President, Eco Technology Center, Hyundai Motor Company unveiled Hyundai’s impressive plans for their next generation Hyundai Tuscon fuel cell vehicle, to be launched next year. Second, in an extraordinary display of industry collaboration, Takashi Moriya, Senior Chief Engineer, Honda, gave a fascinating report on the fuel cell vehicle plans for both of the two Japanese fuel cell heavyweights – Honda and Toyota. And, finally, Dr. Tobias Brunner, Vice President, Great Wall Motor, gave a compelling and provocative presentation on a new approach to fuel cell vehicles. 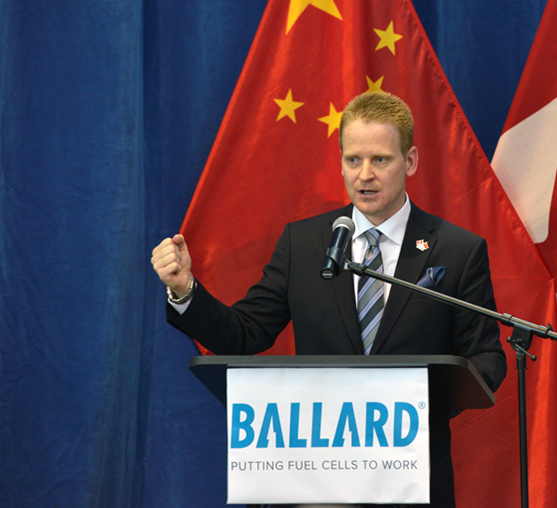 Dr. Brunner discussed Great Wall Motor’s plan to develop and roll-out fuel cell passenger vehicles with a cost-competitive design, very low weight and high energy efficiency towards 2025. In the afternoon session on November 9th, I also joined a panel to discuss the status of the fuel cell industry. On November 10th, the conference held 4 parallel streams of meetings. Shanna Knights, our Director, R&D, presented on Ballard’s technology and product roadmap. While in Rugao, I also had the opportunity to attend (as a Vice Chairman) the International Hydrogen Industry Association. It was an important meeting as the China hydrogen and fuel cell industry starts to mobilize. For me, a key take-away from the conference is the clear industry consensus that the first markets to develop and scale in China (and, indeed, globally) will be fuel cell electric buses, fuel cell electric commercial trucks, and fuel cell electric trains. In these applications, FCEVs offer a compelling value proposition in demanding use cases. FCEVs uniquely offer zero tailpipe emissions, fast and smooth acceleration, and low noise and vibration, while also offering long range, fast refuelling and full route flexibility. These applications also typically have centralized depot refuelling where the vehicles return to base at night - after a long day - for fast refuelling, consistent with current user experience for diesel powered buses, trucks and trains. Of course, these are the market applications where Ballard is strongly positioned, both in China and globally. The strength of our positioning in China was further reinforced during my recent China trip with several new contract bookings. The strength of our positioning outside China was also reinforced over the past few weeks with important new strategic partnerships, including with Siemens for fuel cell electric trains, and with ABB and Royal Caribbean Cruise Lines for fuel cell electric power for certain marine applications. Today I arrived in Brussels to speak at the 10th edition of the Stakeholder Forum of the Fuel Cells and Hydrogen Joint Undertaking, being held on November 22nd. What am I expecting in Brussels? I’m expecting more of the “new same” from a long-standing yet nascent industry that is just now starting to hit its stride.